This afternoon we're welcoming back Nell Goddard, long-time friend of More Precious, newly-published author and all round joy! Read our interview with Nell, as we chat about everything: from pursuing what you're passionate about, and what it's really like to enter the world of work, to losing and finding your faith again. 1. Tell us a little bit about yourself, Nell. Where did you grow up, and how did you become a Christian? I always struggle when people ask me where I grew up, because I moved around a lot as a child; I’d lived in eight houses by the time I was 16, and went to three different secondary schools! But I grew up mainly in Oxford, where I lived for 9 years, from age 5-14. Then I did my GCSEs in Bristol, my A Levels in London, and studied for my Theology degree up in Durham. For now, though, London is home. I grew up in a Christian home as the daughter of two vicars, so God was very much a part of my life from the word ‘go’. We went to church every Sunday, said prayers before bed every night, and I knew the Anglican communion liturgy off by heart by the time I was eight. I made my own personal commitment to be a Christian at a Scripture Union camp when I was 12, but the next few years were very difficult for me and my family. We lost our home and my parents lost their jobs, and because of that I lost my faith. I still went to church, still said all the right things, but God and I were not on speaking terms. Fast forward five years, and it was on my gap year away in Zanzibar with Tearfund that I really came back to faith. As I spent time away, serving others, I realised that God actually cares about me. He loves me not because of who my parents are - something I had always assumed to be the case - but because of who I am, because he made me, and because he has called me by name and claimed me as his own. 2. What does your life look now? What are some of the highlights of your typical week? I’m currently nine months into my first ‘real life adult job’, where I’m a writer for the London Institute for Contemporary Christianity (LICC). An average day can range from writing a marketing email to doing research for an interview, often interspersed with project managing a course for people beginning their working life or planning a talk about Christian engagement with popular culture. A daily highlight for me is my cycle ride to/from work. I will often listen to the Bible in One Year App on my way to work, and then my cycle home allows me to process the day with God as well as enjoying the central London scenery. A highlight of my typical week would be being able to write or commission and edit the ‘Connecting with Culture’ email that LICC send out - it’s always great fun to think up a topic, investigate it, and then write about a Christian perspective on it. Outside of work, I love getting time to myself to write, as well as spending time with my family and close friends, and hanging out with my Labrador, Bramble. 3. How have you found entering in to the world of work? Any tips for girls who are about to graduate? Entering the world of work is a strange one - you think you’re prepared for it, and then the commute plus the office hours plus all the information and responsibility hits and you can end up feeling quite overwhelmed. I honestly spend a lot of my time convinced that everyone’s going to realise I’m a fraud, and send me back to school or something… but they haven’t yet! I certainly miss the freedom and excessive holidays of university life, but I love having a bit more structure to my week, and everyone I work with is ridiculously lovely. I honestly couldn’t have asked for a nicer first job, even if the transition part came as a bit of a shock! Even if you’ve remained in your university city, your life is going to look very different, and most of your time won’t be your own anymore. Be prepared for the emotions that come with that, and make sure you keep in contact with your uni friends, supporting each other, praying for each other, and reminding each other why you’re great. There will be days when you’ll need it! That could be reading some good books (shoot me an email for some recommendations! ), perusing some online articles, or *shameless plug* coming on the course that LICC runs for Christians starting work. Your work is going to take up most of your time, and you have a great opportunity to be salt and light for Christ where God has put you – think and pray about how you’ll do that! 4. Looking back over the past year, how has God been at work in your life? This is such a big question! Since I began university (I know, that’s the last 3.5 years… sorry!) God has been continually teaching me to trust in him, to wait for him, and to live life as an adventure with him. As I was thinking through what to do after uni, he guided me through friends’ wise counsel, gently closing some doors whilst opening others I thought were permanently sealed, and giving me a deep peace when everything seemed very uncertain. Another way in which God has been at work in my life is through the people he has placed alongside me. I have been amazed and how, time and time again, God has answered my whispered prayers for a friend, and he has delivered in the most unlikely and incredible of ways. I always thought it was up to me to make friends, but God has slowly been teaching me that I need only ask, and I will receive - even friends! Probably most surreal of all, though, was what happened just under 2 years ago. I got a random email from a publisher, asking me to write them a book proposal. 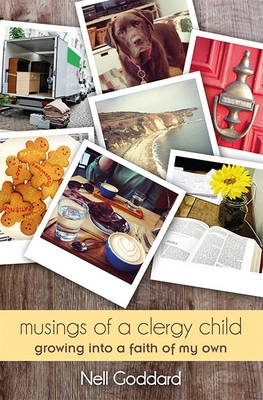 They’d found my blog and wanted me to put together a book for clergy children and teenagers who were growing up in Christian homes but struggling to find their own faith. I genuinely thought the email was a joke! Apparently not. So, one Saturday when I definitely should have been writing an essay, I sat down and wrote a book proposal. I think I even sent it off without getting anyone to check over it - that’s how convinced I was that they wouldn’t take me seriously! But, in February of last year, I got an email saying my book proposal had been accepted, and the summer after my degree I sat down to write a book. It seems crazy to say it, but it comes out on June 23rd (TOMORROW)! 5. As a newly published author aged 23 (!) what advice would you give to girls who want to step out in faith into new opportunities, but are lacking the courage, or feel too young/not qualified enough? As a teenager, I spent a lot of time wanting control. I wrestled control off God and held onto it very, very tightly. Then one day, away in Zanzibar, I reached the end of myself and God said to me ‘Give me the control and watch what I can do’. The very next week we’d raised £1500 in 24 hours for a water tank in a poverty-stricken village. After that, I knew God was far better at being in charge that I was, so I just jumped on the bandwagon and let him drive. It’s certainly easier said than done, but I promise it’s worth it! If you feel that God is calling you to do something or get involved with something then pray it through. Talk to someone older and wiser, ask (and listen to!) their advice. PSA: all adults are just winging it, all the time. Seriously. The week I got my first paycheque I also got myself locked in a bathroom for over an hour (they had to drill through the door to get me out), and walked face-first into a staircase. No-one really knows what they’re doing - if someone looks like they have their life together it’s just because they’re really good at faking it. I promise! So, take a deep breath, put your trust in God and his everlasting arms, and take a step out. You never know where God will take you next. 6. You are somebody who is incredibly passionate about the causes you believe in (i.e. social justice and equality for women). as well as being a gifted writer and communicator. How do you channel your gifts and passions into a form of action? There’s a line in Chariots of Fire where Eric Liddell, the protagonist and a champion runner, says ‘God made me fast. And when I run, I feel his pleasure’. What is it that when you do it, you feel God’s joy and delight? What makes you come alive? For me, it’s writing. For you, it might be dancing, painting, swimming, philosophising, studying… the list goes on. This is something God has given you - take your gifts and your passions and use them for his glory. He delights in us! In terms of moving passion to action, some good questions to ask yourself are: what keeps you awake at night? What issue makes you righteously angry? If you could change one thing in the world, what would it be? Once you have the beginnings of an answer, do something about it - investigate charities, student/school groups, fundraising opportunities etc. You’re never too young to make a difference. Finally, of course, just give it a go! It seems so simple, but I know it’s tricky. As I led Just Love in Durham, I found a lot of people who had a bunch of incredible ideas, but were just waiting for someone to give them permission to do them. Sound familiar? Well, here’s your permission - go for it! 7. Finally, if you could go back and give one piece of advice to your 15-year-old self - what would it be? Five simple words: God has not forgotten you. Then I would probably follow it up with a bit of an explanation - just because you can’t see the sun behind a cloud doesn’t mean it’s not shining. God is faithful - trust him. Look for him in the quietest and most unlikely of places - in the random gifts, the cups of tea, the friends who bring you comfort and let you cry with them. Don’t stop praying for miracles - he’ll deliver in ways you couldn’t even begin to imagine. He is still there, even if you can’t feel him right now. He hasn’t failed before, and he’s not going to start now. We'll be hearing more from Nell next week about the challenges and joys of growing up with parents involved in church ministry. In the meantime, why not order Nell's new book below? We think you'll love it!